Welcome to the First episode of my Makeup Tutorial PLaylists on Youtube ! Here's an easy way to do a bullet wound on any body parts in just less than 2minutes ! My trick sounds require to wait the latex to be cool off as I would roll the hole off instead of cutting through the bullet wound. 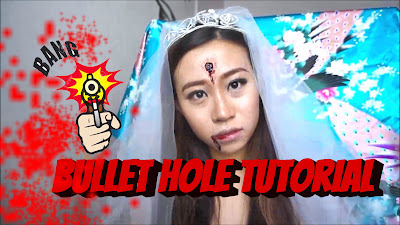 This bullet wound tutorial would be useful for haloween or any occasions you require to make such wound effects !